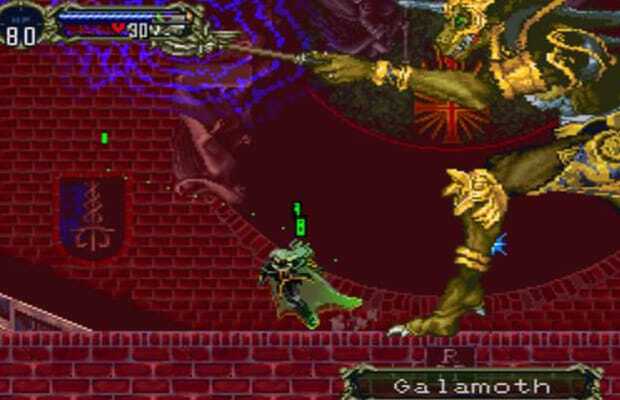 There are several enemies in SotN that would probably qualify for this list, but Galamoth, (i.e. Dracula’s own personal Hell-Anubis) beats them out of sheer longevity. The beast’s massive form is bigger than the screen, and when he’s not dual-thrusting at you with his massive melee weapons or otherwise trying to bludgeon you with his clawed feet, he’s populating the screen with volleys of heavy damage lightning orbs and magical electrical storms that cover a wide swath of the screen. Don’t be fooled by those exposed shins—even with good reflexes and strong weapons, Galamoth can take upwards of ten minutes to kill. If you don’t know what you’re doing, he’ll make a mockery of you.